As some of you already know, there's been a change of plans. I had originally scheduled our fourth discussion on Apocalypse Now, but after reflecting on the movies I'd assigned so far, I realized how graphically violent they all have been. I feel responsible for the images I ask you to place in front of your eyes every couple of weeks, and I don't want to take that responsibility lightly. 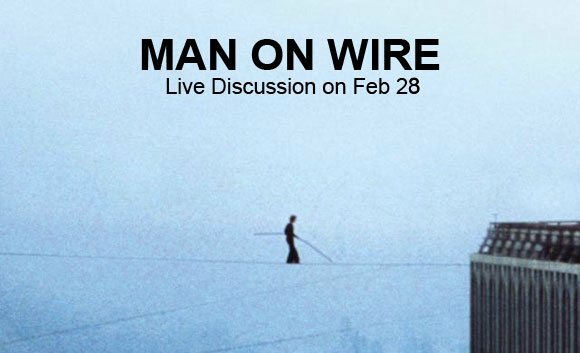 So to keep you from being immersed in intense violence for two straight months, we'll discuss Man on Wire instead and give you a break. It will still be a fun experiment because it's a documentary instead of the usual narrative fare, and should provoke a slightly different type of discussion. It has won many awards, and even has 100% on Rotten Tomatoes, so I'm hoping you'll enjoy it! The discussion will still be at the same time I had originally planned: Feb 28th at 8:30pm PST via Google+ Hangout. Lucky for all of you, if you have either Amazon Prime or Netflix, you can stream it for free! Otherwise, just head to your local library or Blockbuster, they should have it there. As always let me know if you can make it so I can make sure you're on the hangout invite list. I'd love to get as many of you as I can in the discussion! And if you want the details of each discussion delivered straight to your inbox, sign up for my email updates here. And if you missed any of our discussions so far, you can always check the archives to catch up. See you all soon!